Previously published as Truth and Duty: The Press, The President, and the Privilege of Power. 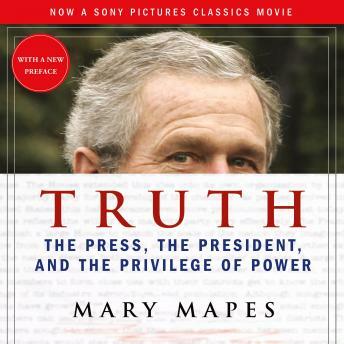 A riveting play-by-play of a reporter getting and defending a story that recalls All the President's Men, Truth puts readers in the center of the '60 Minutes II' story on George W. Bush's shirking of his National Guard duty. The firestorm that followed that broadcast--a conflagration that was carefully sparked by the right and fanned by bloggers--trashed Mapes' well-respected twenty-five year producing career, caused newsman Dan Rather to resign from his anchor chair early and led to an unprecedented 'internal inquiry' into the story...chaired by former Reagan attorney general Richard Thornburgh. Truth examines Bush's political roots as governor of Texas, delves into what is known about his National Guard duty-or lack of service-and sheds light on the solidity of the documents that backed up the National Guard story, even including images of the actual documents in an appendix to the book. It is peopled with a colorful cast of characters-from Karl Rove to Sumner Redstone-and moves from small-town Texas to Black Rock-CBS corporate headquarters-in New York City. Truth connects the dots between a corporation under fire from the federal government and the decision about what kinds of stories a news network may cover. It draws a line from reporting in the trenches to the gutting of the great American tradition of a independent media and asks whether it's possible to break important stories on a powerful sitting president. A riveting play-by-play of a reporter getting and defending a story that recalls All the President's Men, Truthputs readers in the center of the '60 Minutes II' story on George W. Bush's shirking of his National Guard duty. The firestorm that followed that broadcast--a conflagration that was carefully sparked by the right and fanned by bloggers--trashed Mapes' well-respected twenty-five year producing career, caused newsman Dan Rather to resign from his anchor chair early and led to an unprecedented 'internal inquiry' into the story...chaired by former Reagan attorney general Richard Thornburgh. Truth was made into the 2015 film Truth, starring Cate Blanchett, Robert Redford, Topher Grace and Elizabeth Moss.